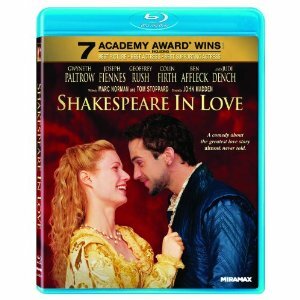 Shakespeare in Love was one of those films which swept up critics and audiences alike. It was highly praised and its theaters highly trafficked, boasting seven Academy Award wins garnered by a combination of hype and the Harvey Weinstein’s determination for accreditation. Perhaps I sound a bit cynical, and this may have something to do with the large sums of money thrown around by the Weinstein gang and Miramax during award season, assuring their films receiving attention above all others during the 90s. It isn’t that I didn’t enjoy Shakespeare in Love, but few films have felt more over-hyped to me. Only three other films come to mind as more underwhelming; Titanic, Juno and the last of those little Lord of the Ring films. The silly little story begins with writer’s block. One of humanity’s most prolific and poetic writers is stuck, without an idea or inspiration. Will Shakespeare (Joseph Fiennes) doesn’t know what his next play will be until he meets the enchanting Lady Viola (Gwyneth Paltrow), which starts a forbidden love and the inspiration for his next work. Released in 1998, shortly after the success of Baz Luhrmann’s ultra-hip restyling of Romeo and Juliet, Shakespeare in Love is yet another film which tends to rely heavily on the impression that Shakespeare did little else other than tell the tale of these star-crossed lovers. With my exasperation at the over-praise of Shakespeare in Love completed, I will proceed with hypocrisy and list the qualities which I do admire in John Madden’s film. As distasteful as I may find it to watch the leading actors, there are quite a few supporting performances which are surprisingly delightful. One of the highlights of the film is watching Judi Dench in the role of Queen Elizabeth. Ben Affleck is also amusing, although perhaps not even close to the most convincing actor cast here. And it appears we have already swayed back into the criticism of Shakespeare in Love once again. Before I had time to mention my admiration of Geoffrey Rush and Colin Firth, I am reminded of the major reason this film irks me. Miramax films tended to rely heavily on their stock actors, and among those were Ben Affleck and Gwyneth Paltrow. Without Miramax we may not have ever known who she was in the 90s, and often she was crammed into roles that weren’t right for her. Emma is the worst offender, but I find the casting in Shakespeare in Love hard to swallow. I can do without Joseph Fiennes as well. The Blu-ray is far more impressive than the film itself, in my opinion, boasting a high definition presentation that is able to highlight the strong production values of the film. The special features are all that seem to be lacking. There are some, including two audio commentaries and two featurettes, as well as deleted scenes and trailers. These just aren’t new special features.